This is a custom made Deep V Hull by Sea Tech Boats in Florida. It is a solid boat made with no wood. 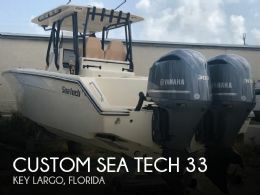 It is powered by twin 300 HP Yamaha 4 stroke engines with warranties. This boat will get you out to the fishing grounds and back quickly and safely. It has plenty of storage for your gear and a Yeti cooler to put in your favorite beverages. Also, plenty of rod holders and a 30 gallon live well for your baits. In deck fish boxes to keep your catch. This boat is good looking and will make a great boat for those weekend runs to the Bahamas.